One of the main reasons why my group decided to play this game and do a Samurai Spirit review was because we had heard it had a similar feel to Ghost Stories (It was, after, all, made by the same designer). That obviously intrigued us considering that Ghost Stories is one of our favorite co-op games, but we also came in with some pretty high expectations. Read on to find out what we think about this one. In Samurai Spirit, you and your teammates have to fight off enemies who are trying to destroy the local village. In order to win, all of the samurai have to survive three rounds of raids and at least some of the village needs to stay intact. 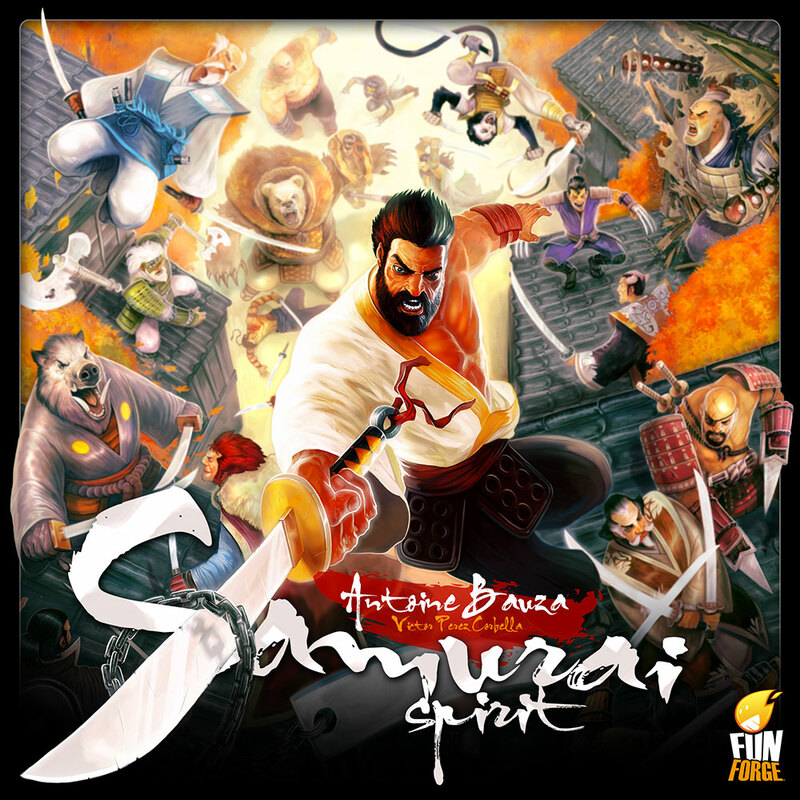 Samurai Spirit was designed by Antoine Bauza and published by Funforge. The Samurai Spirit rules are quite easy to understand, so most people will be able to jump right in and start playing in no time at all. There are just a few actions that you can take, but it’s what you choose to do after you take those actions that makes the game entertaining. Each character has a battle/life track, a talent, and a Kiai (a second special ability). The Kiai ability activates when a player gets down to exactly the highlighted level on their battle track. The character cards also have a spot where they can protect specific parts of the village by moving enemy cards there with those symbols. On each turn, players can take one of three actions: Fight, Support, or Pass. Fighting allows you to either protect one part of the village from the oncoming raiders, or you can “confront” them by putting them on the right side of your card. When you use support action, you share your ability with another player for one turn. Players can pass when they don’t want to risk taking penalties, and you have to pass when your battle track ever gets past the Kiai value. When a round ends, the raiders go on the offensive. If any of the symbols on the left side of the characters’ cards are not defended, then negative effects occur. After that, any raiders that have moved to the intruders deck attack the village. A new round begins by adding in more difficult enemies to the raider deck. To win the game, at least one farm and one family needs to be in the village after the third round has ended. You lose if any of the samurai have died, or if you weren’t able to save at least one farm and family. If you want to see a complete explanation of the Samurai Spirit rules, take a look at the official Samurai Spirit rulebook (PDF). Samurai Spirit is extremely easy to learn and teach, which is great considering that you can play with up to six other players. When I taught my group this game, we were up and running in less than 10 minutes. You might think that the decisions are easy in this game, but many of them aren’t. In fact, many of them feel risky, which adds tension to the experience. For example, you might want to use your special ability to draw a second raider card, but you run the risk of taking penalties if you happen to draw a card that you can’t deal with. This is one of those rare quick-playing co-op games with depth. 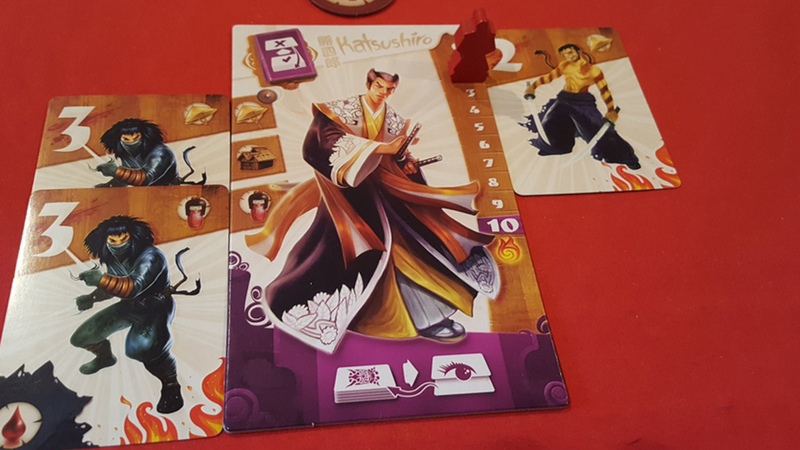 It can be played as a filler before you move on to a bigger game, or you can play two or three games of Samurai Spirit in under two hours. Samurai Spirit is a bit more repetitious than most other co-op games. Some of your turns will take less than a few seconds because you will pick up a card and only have one action that you can take. Some people will not like the amount of luck that goes into this game. Like most card games, you are relying on good draws. Sometimes you will get the card you want, while other times you get the card that shuts you down. That’s the case in a lot of games, though, and it is only really a “con” if you aren’t into the theme and mechanics of the game. Another minor issue that we have with the game is that the characters feel a bit samey after you’ve played a few times. They do have a couple of powers, but they aren’t different enough to make you feel like unique characters in the group. On the overall, my group thought that Samurai Spirit was slightly above-average, but not nearly as good as Ghost Stories. I actually enjoyed it more than anyone else in the group because it’s challenging and short, and I like the fact that I can play it with so many other people. It’s the type of game that I won’t play all the time, but I will definitely pull it off the shelf when I need a quick, fun co-op game. While Samurai Spirit isn’t one of our favorite cooperative board games, it is right outside of the top 5 in our family games list. If you need a co-op game that is quick and can be played by a lot of people, then you definitely should take a look at this one. Thanks for taking the time to read our Samurai Spirit review!